MERRIMACK, NH--(Marketwired - September 20, 2016) - Innovative product developer and specialty retailer Brookstone announced that it will release limited edition Ariana Grande Cat Ear Wireless Headphones. The wireless headphones feature cat ear-shaped speakers on top of the headband and customizable color-changing accent lighting on both the earcups and cat ear speakers. The Ariana Grande Edition will have a brilliant chrome finish and be available for $149.99 in Brookstone stores and at Brookstone.com in time for Christmas. Preorders may be placed online starting Tuesday, September 20th. "Ariana looks simply amazing in her new Cat Ear Headphones," said Brookstone CEO Steven Goldsmith. "She's so much more than a tremendously talented singer and performer. She's created a whole world of style and fun and beauty, and we wanted to create something that would fit perfectly into this world. We knew she loved cat ears, and that we had a good design, but we weren't prepared for just how wonderfully they complement her amazing style." "Working with Brookstone to create these amazing headphones has been a blast," said the multi-platinum award-winning Grande. "They represent my style -- fun, edgy and unique and I know my fans will LOVE them as much as I do." 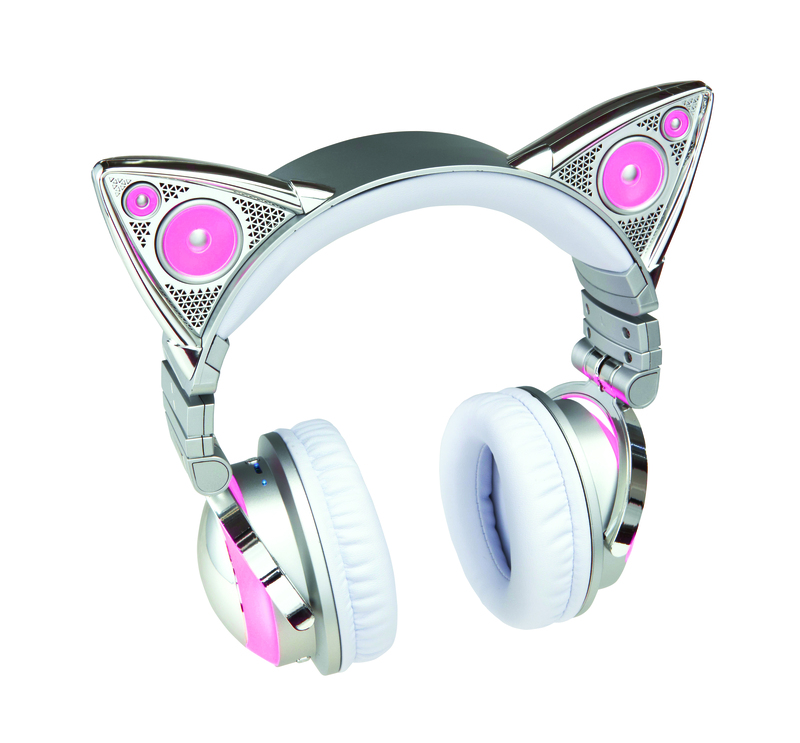 Brookstone Cat Ear Headphones have a strong following within anime and cosplay communities. The headphones evolved from an idea by Axent Wear co-founders Wenqing Yan and Victoria Hu. Axent Wear partnered with Brookstone to develop, manufacture and bring the headphones to market. "Designing a pair of wireless headphones with Ariana has been a really special project for everyone here at Brookstone, and she's been a joy to work with," said Goldsmith. "We can't wait to get them into the hands of her fans." The new headphones pair wirelessly to any Bluetooth® enabled device, and let the user choose between listening to music privately and playing the music out loud on the cat ear-shaped speakers. The built-in lighting on the earcups and cat ear speakers can now change between seven colors. Within less than a year, ARIANA GRANDE captured #1 on the Billboard Top 200 twice -- first with her Republic Records debut, Yours Truly, and also with its 2014 follow-up, My Everything. In 2013, she was named "Best New Artist" at the American Music Awards. Other accolades followed with ARIANA winning "Favorite Breakout Artist" at the People's Choice Awards 2014, the "Young Influencer Award" at the iHeartRadio Music Awards, the "Radio Disney Chart Topper Award," "Choice Female Artist" and "Choice Single" "Problem" at the 2014 Teen Choice Awards, and more. At the 2014 MTV VMAS, "Problem" was named "Best Pop Video" as well. In November, ARIANA took home the award for "Favorite Female Artist - Pop/Rock" at the 2015 American Music Awards. 2016 sees her release her mega-anticipated third full-length album, Dangerous Woman, driven by the title track which captured #1 on both iTunes Overall Top Songs Chart and Top Pop Songs Chart minutes after release. "Dangerous Woman" also debuted in the Top 10 of the Billboard Hot 100, earning her the distinction of becoming the first artist to debut on the chart with the lead single from her first three albums. For concert dates and locations of Ariana's 2017 Dangerous Woman Tour, visit dangerouswoman.com. Brookstone, founded in 1965, is a U.S.-based product developer and retailer of wellness, entertainment, and travel products that are simply amazing and amazingly simple. Brookstone products are available at its 200+ retail locations at malls and airports throughout the U.S., online at Brookstone.com, via its Brookstone catalog and through select premium retailers. Brookstone is a member of Sanpower Group Company. Sanpower Group Co., Ltd. is a private conglomerate whose primary businesses are engaged in technology and modern service industries. With big data serving as its core competitive advantage, Sanpower is rapidly building up an industrial ecosystem across the finance, health and commerce sectors. The company now has an excess of RMB 100 billion in both total assets and annual gross sales, and a controlling stake in more than 100 subsidiaries. Through this diverse set of businesses, Sanpower provides growth opportunities for a 90,000-strong global workforce, including 30,000 staff from its non-Chinese enterprises.